I’ve had the unique pleasure of knowing Leah Dion for several years. She and I have journeyed through ministry together long before I began leading women. Leah’s journey has been especially difficult. However, I’ve seen God grow and shape this woman to more of His likeness. For those of you who have struggled with anxiety and really tough season, I feel certain God will speak to you through Leah’s words. It’s not that I heard anyone label me “not good enough.” I’ve crippled myself as I have accepted those lies of the Enemy – the ones that chain me to a life of anxiety. I’ve set up expectations for myself that I can never fulfill. My measuring stick is perfection, and I fall short every time. This year, the anxiety I’ve long struggled with became more than a struggle. It began to consume me. God (through Christian counseling) showed me some destructive thought patterns I learned very early in life. I believed my worth was in my performance and what others thought of me. These lies have defined my life. They carved deep trenches from which I could see no escape. And I would hear about being “free” and “resting in Him” and wonder, “how do I get to those places?” They seemed like a far away land. I asked God, why does this anxiety keep on coming, one wave after another, keeping me down where I can hardly breathe? He began to show me what He was doing. It was my healing. He was drawing out the poison. One by one, the lies I have let into my soul, the ones that shackle me, were being illuminated—to shed light on what needed to be extinguished. But isn’t the perfect place to be rescued at the end of myself? When I looked to myself and found absolutely nothing. I was in the perfect place to be used by Almighty God. The answer was clear. I had to let go. But letting go doesn’t come naturally. It requires carving intentional time for my Maker—and not just in the dark moments. I’m begging for His perspective daily, for a new lens through which to see myself. I want to let go of those standards I could never meet. It’s letting go of living to please others and letting Him rewrite my worth, according to His Word. It’s saying yes to the skin on me, the place I’m in, the life I live, and even to the horror I’ve walked through. Standing before Him with open hands and no longer fighting His will. I’m not a butterfly yet, but I finally know what He means by “offer your life as a living sacrifice.” Transformation is a process, allowing God to turn the greatest ugliness into the most beautiful. 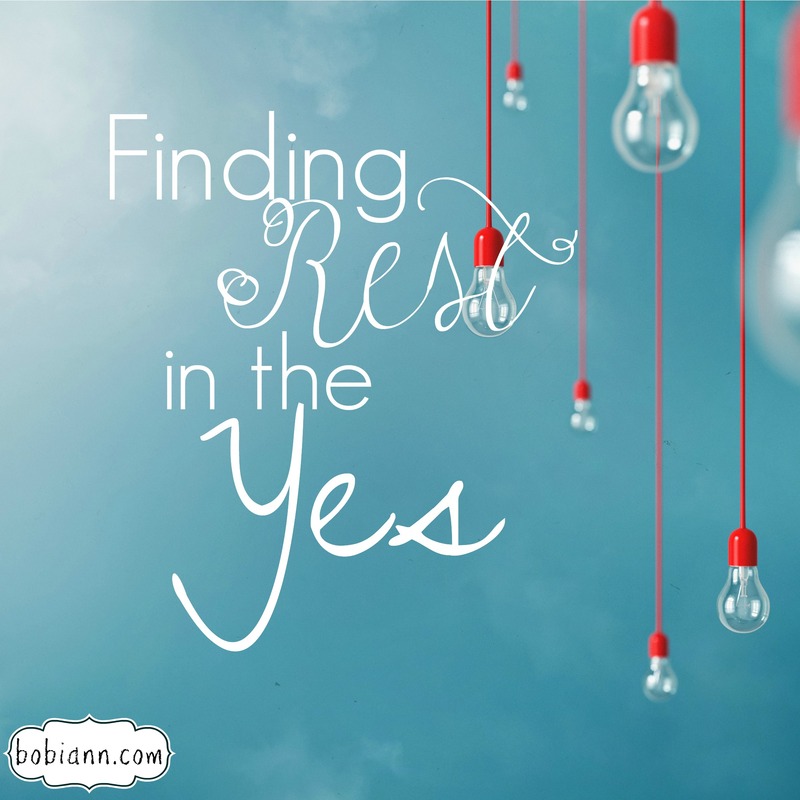 “Letting go and saying yes” is an echoing theme in my life. In fact, I named this year my Year of Yes, hoping it would spur me onward to my goal. It’s almost December, and I’ve yet to surrender it all. Yes, God, I accept my failures and am exactly who you say I am. Yes to my chronic illness, my loss, my grief. Yes to His plans, His path for my life, and to the good works He has prepared in advance for me! The cure for anxiety is letting my plans go and trusting God is good. It’s remembering His promises to me. After my Mom’s suicide, a dear friend showed me Isaiah 61:4. Now I know I am called to be “rebuilder of the ancient ruins, repairing cities destroyed long ago, that have been devastated for many generations.” I am changing the course for the next generation in my family. [Tweet “The cure for anxiety is letting my plans go and trusting God is good.”] I am not destined for the pit! I am not to continue the heritage of anxiety that was passed to me, ingrained in me. I have been called to a higher purpose. And it will be hard. It will require supernatural Jesus-intervention to curve my natural inclination to inch back to the pit. And it’s worth it. Suffering for Christ is the most noble cause. I will believe Exodus 15:26, “I am the Lord who heals you.” I am ready to receive healing for all the broken parts of me. I will reconcile to Him the wounds that still sting and accept whatever He has given—this time, with unclenched fists. That is the most whole healing. I will take up my Armor, because I am a Warrior Princess. I am in a real battle I never understood. But my eyes have been opened. I will believe Joshua 1:13, The LORD your God is giving you a place of rest. And I know exactly how to find it…it’s in this YES of mine.